Fishtown Hops beer garden, located on the riverwalk directly behind SugarHouse Casino, opens with free parking on Thursday, June 22, at 4 p.m. Featured is a rendering of what it will look like. Groundswell, the masterminds behind Spruce Street Harbor Park's design, have created another beer garden on the waterfront. Fishtown Hops at SugarHouse Casino will open on Thursday, June 22. “The Groundswell creative team is outdoing itself as it transforms our backyard into a lush, cozy, urban hideaway — everything you’d want in a Philadelphia beer garden," said Wendy Hamilton, general manager at SugarHouse Casino. 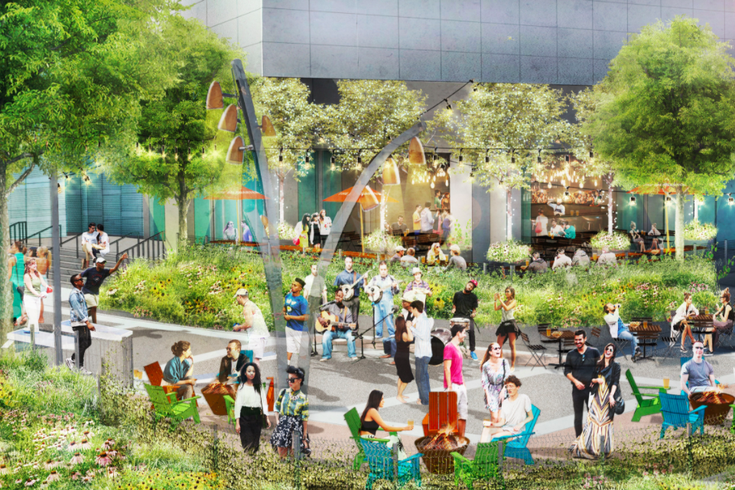 The space will hold approximately 150 guests, offer views of the Benjamin Franklin Bridge and feature fire pits, a rotating list of food trucks, lawn games and live music. Entertainment and food trucks will be on-site Thursdays through Sundays. As for the drink menu, there will be craft cocktails and local beers. During happy hour – daily from 5-7 p.m. – pitchers of beer will be half-price. Fishtown Hops will be open daily. On Wednesdays and Thursdays, the garden will be open from 4-10 p.m., on Fridays from 4 p.m.-2 a.m., on Saturdays from noon-2 a.m. and on Sundays from noon-8 p.m. through the summer. To get to the beer garden, walk along the south side of the casino.